EHS senior Sidney Cook blasts her first of two home runs in the Lady Eagles’ 23-2 victory over Miller on Tuesday in Tuppers Plains, Ohio. TUPPERS PLAINS, Ohio — Making a habit of rounding the bases. 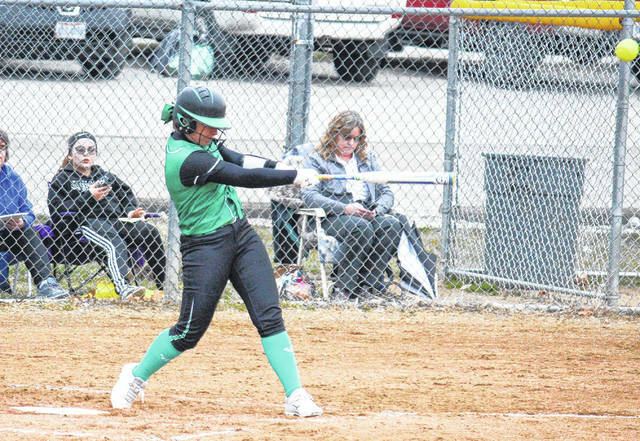 The Eastern softball team crossed home plate nearly two dozen times on Tuesday in Meigs County, as the Lady Eagles defeated Tri-Valley Conference Hocking Division Miller by a 23-2 count. 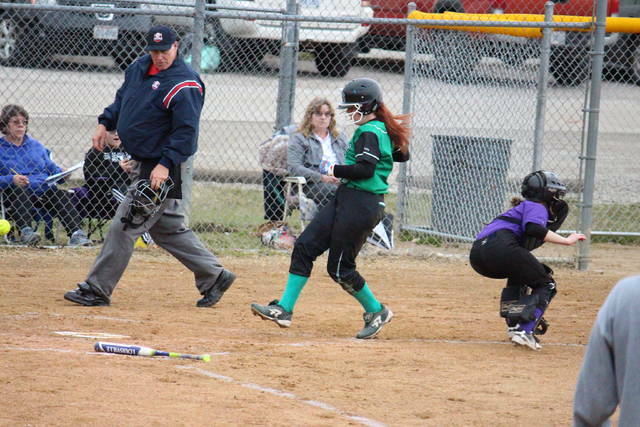 Without the benefit of a hit, the Lady Falcons scored the first two runs of the game in the top of the first inning. Eastern (1-1, 1-1) answered with 10 runs in the bottom of the frame, capped off by a two-run home run by Sidney Cook. After Sydney Sanders drove in Tessa Rockhold, and Cera Grueser doubled home Kelsey Casto in the bottom of the second inning, Cook hit another home run, this time a three-run blast that made Eastern’s lead 15-2. Eastern combined four walks with an MHS error in the third inning, leading to three more runs. EHS capped off the 23-2 victory with five runs in the bottom of the fourth, combining four free passes, two errors and one hit. A trio of Lady Eagles combined for a no-hitter in the circle for the victors. EHS senior Sophie Carleton started and pitched two innings, allowing two unearned runs, while striking out four batters and walking two. Elaina Hensley pitched the next two innings, struck out three batters and walked one, while Tessa Rockhold pitched the final frame and struck out all-3 batters she faced. 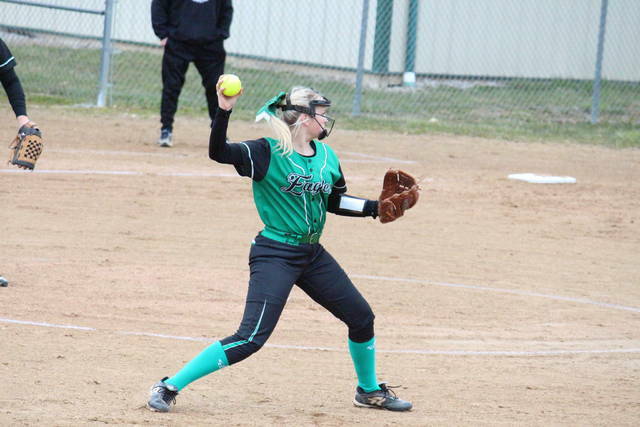 Smith started for the Lady Falcons and suffered the setback in 1.2 innings, allowing 15 runs on 14 hits and two walks. Cook led the EHS offense with a 3-for-3 day, which included two home runs, three runs scored and five runs batted in. Emmalea Durst was 3-for-4 with a double, a run and an RBI, Tessa Rockhold was 2-for-2 with two doubles, four runs and one RBI, Sanders was 2-for-3 with three runs and one RBI, while Grueser was 2-for-4 with a double, three runs and three RBIs. Courtney Fitzgerald tripled once, scored once and drove in two runs, while Carleton and Hensley both singled once and drove in two runs, with Carleton scoring twice and Hensley scoring once. Casto scored three times and drove in one run, Kelsey Roberts had one run and one RBI, while Faith Smeeks had two RBIs, Ally Barber had one RBI, and Kennadi Rockhold scored once. Alexander and Peranie each scored a run for the guests. Eastern committed two errors in the win, while Miller had five defensive mishaps. The Lady Eagles left six runners on base, twice as many as MHS. 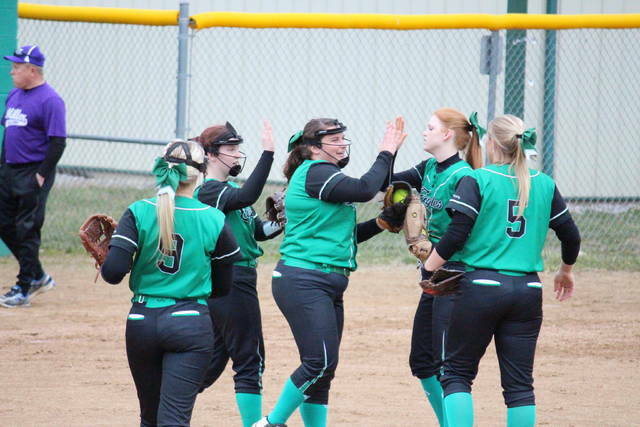 The Lady Eagles will try to sweep Miller on April 16 in Hemlock. Eastern is scheduled to be back in action on Thursday at Waterford.